Our unique and unique range of environmentally safe travels! Travelling without a car - you'll receive free comfort offers and reductions. In both houses, right next to each other, you can find 8 comfortable appartements. Enjoy the unique, traffic-free and sunny location of the appartements with a overwhelming panoramic view! 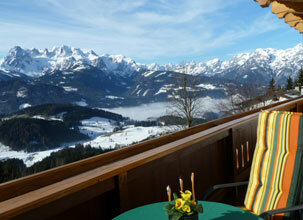 The marvellous silence, the hospitality of Family Kasberger and the comfortable appartements speak for themselves. 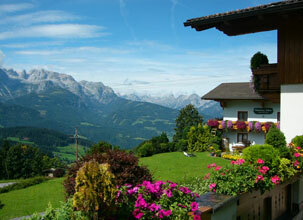 Werfenweng is, both in winter and summer, a very attractive holiday resort. Relax in the summer on our lawn for sunbathing with a picnic site for barbecuing. In winter the free ski bus brings you to the about 3 km distant ski-area of Werfenweng. Furthermore we have numerous other ski-areas in the direct area. You can leave your car at home and you are still moveable. From 09:00 am to 10:00 pm the free shuttle service is available as your personal chaffeur-service. All "SAMO"-guests can use this service within Werfenweng. The night-shuttle can bring you back home from 07:00 pm to 04:00 am. Family Kasberger is looking forward to welcoming you!